I’m constantly recommending this book to new artists because it covers many fundamental topics on perspective with pragmatic exercises. But what’s so great about it? How To Draw is a very large book. It totals over 200 pages and measures 9” wide by 11” tall. It’s full of quality tips from the renowned artist Scott Robertson who currently teaches concept art classes at various schools in California. Scott’s knowledge is seemingly endless and it shows in this book. He teaches very powerful principles to master perspective and train your eye for imaginative drawing. Concept artists work mostly from imagination so there’s something to be said about this type of practice. How To Draw focuses primarily on the subject of perspective but it’s still one of the best general art exercise books you’ll find. In “How To Draw” you’ll learn all the basics like 1-point, 2-point, and 3-point perspective. These strategies can be applied to environments but also objects in an environment. Each chapter follows the previous one with lessons that build on top of one-another. If you’re a complete beginner you’ll really need to practice the lessons hard to ensure you gain enough competency before moving on. The best part is the first few chapters where Scott teaches you how to make proper marks on the page. Line work is crucial and the quality of your circles/ovals will play a big role in your drawing capabilities. I would say this book will help you improve certain fundamental skills, but not everything needed to become a pro. You will see improvements in your ability to see and draw accurate perspective. But it’s unlikely that you’ll see major jumps in your ability to draw from imagination unless you already have some skills. This means even intermediate level artists can pick up this book and learn something by working with the lessons. It truly is a book for all skill levels and has something to teach everyone. How To Draw comes with a few chapters dedicated to specific exercises for specific techniques. Here’s a breakdown of the book chapters. In the very first chapter you’re given an outline of resources to use for your drawing lessons. Scott recommends working solely in ink to restrict erasing mistakes. This may not be something you’re familiar with but it’s always worth trying new things. And since ink is permanent you’ll be forced to carefully consider every single line you make. Once you get started with pen it’ll just feel natural and it may become your preferred tool for sketching. The biggest challenge is the jump in skillset as you move along through each chapter. Once you move beyond the chapters on shapes & volumes the difficulty increases dramatically. Same with the chapters that talk about drawing environments, aircrafts, and vehicles. Readers might make the assumption that they’re expected to become incredibly skilled artists by the last 3-4 chapters. Note this will not happen unless you put in hours of time for months on end. So don’t be discouraged if you reach these later chapters without as much progress. How To Draw gives you exercises and guidance. But this can only go so far because at some point you need to put in real consistent work to reach the skill level you want. The biggest issue most people have with this book is lack of instruction in later chapters. When first getting started everything makes sense and you can follow the exercises perfectly. Once you get to the lessons on vanishing points and perspective grids things tend to move fast. Very fast for a novice artist. You might get lost and end up frustrated in the later chapters. You might feel left behind without much genuine instruction. Part of the issue is a lack of explanation for vanishing points that go off the page. This is also true regarding major ideas of perspective like the cone of vision. I would not say that Scott ignores these topics, but rather doesn’t cover them in enough detail. This is why many people feel “How To Draw” isn’t really made for total beginners. Novice artists can work their way through basic lessons but will eventually hit a wall. However this isn’t necessarily a bad thing. If you’re willing to start with the intro lessons and practice on your own then you’ll build up skills quickly. Then you can always move on with further lessons as you improve. 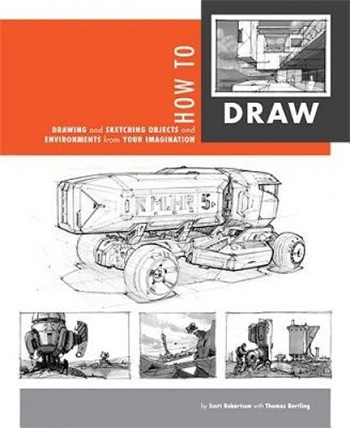 In my opinion “How To Draw” is not a one-size-fits-all book. It will not solve all of your perspective problems. But it will give you a large head start with real exercises you can practice on a daily basis to improve your imaginative construction techniques. Each lesson is created and explained with a step-by-step approach. Beginners may feel overwhelmed when it seems like step 1 and step 2 jump drastically in capabilities. But the more you practice the easier it’ll be to digest this information. I personally own How To Draw and would absolutely recommend it for artists of all skill levels. Beginners should be wary only because this book won’t teach you everything, and it does have a big jump in skill level towards the later chapters. But this book should act as one of many reference guides during your learning process. As a companion piece I’d also recommend a book on perspective, really any title you want, since the topic compliments this book quite nicely. And if you really like Scott Robertson’s writing style then you might also enjoy his other book How To Render. This is another book covering novice-to-intermediate topics and it works well for self-taught artists. If you want a valuable and unique teaching tool with lessons from a truly skilled artist then How To Draw is a brilliant book to pick up.